Did Donald Trump Oppose The Iraq War Before Anyone Else Or Is It Just Another Example Of His Braggadocio? 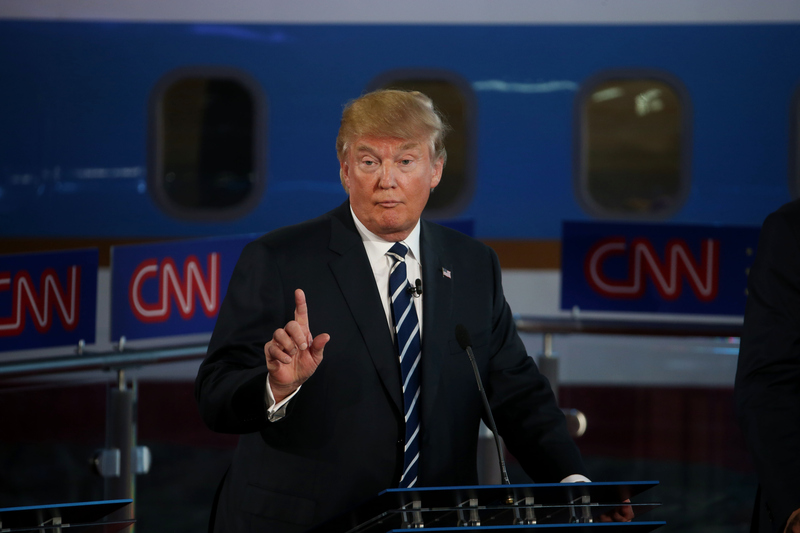 Donald Trump made a pretty huge claim during Wednesday's GOP debate on CNN when he said that he was the only Republican presidential candidate who opposed U.S. involvement in Iraq after 9/11. Trump said that he was always opposed to the war, from the beginning, and that all of the other candidates on the stage were supportive of it. Did Trump oppose the Iraq war earlier than anyone else? Though he did oppose the war, he definitely wasn't the first, and he was quite late to the game. This is the second time Trump claimed that he came out against the Iraq war before any of his other opponents and before most politicians, generally, according to Vox. In the first Republican debate in August, Trump said, "In July of 2004, I came out strongly against the war with Iraq because it was going to destabilize the Middle East," according to Vox. Then, he made the claim that he was the only one on the stage "who had the vision to say it, and that's exactly what happened. The region became totally destabilized." Trump did come out against he Iraq war in July 2004, but that was more than a year after the war had started, according to the The New York Times. At that time, a number of politicians had come out against U.S. involvement in the Middle East, so Trump certainly wasn't the first. Furthermore, Trump definitely wasn't the first on the debate stage to come out against the Iraq war. Ben Carson has repeatedly said that he was always against the Iraq war, though it is kind of hard to verify since he wasn't in the political spotlight before or during the war, according to The Hill. Kentucky Sen. Rand Paul also stood up to Trump on Wednesday night when he restated his claim that he was the only one on the stage opposed to the war. Paul said, "I made my career being against the Iraq war," according to a tweet from the senator. And Paul's claim checks out. He has repeatedly stood against U.S. involvement in Iraq and other parts of the Middle East, according to On The Issues. Trump may have opposed the Iraq war privately prior to the 2003 invasion, but Huffington Post reporter Michael Calderone could not find any evidence that Trump publicly came out as being against the war prior to the 2004 interview that he referenced, when many media and politicians had already denounced it.